Credit: courtesy of Colin Price and the Designer Fund. Every morning Khan Academy’s lead designer, Jason Rosoff, spends the first 15 minutes of his day reading over the constant flow of new feedback from Khan Academy’s 10 million monthly users, who hail from more than 200 countries. In the company’s airy offices on the second floor of a building that bumps up against Google’s sprawling Mountain View campus, Rosoff pours over these little details from sometimes frustrated users that collectively can overwhelm. Do algebra students like the new feature they added? Are students still having problems getting credit for their calculus exercises? Rosoff — who was one of the first employees hired at the non-profit over three years ago — calls the daily morning ritual his way of keeping a finger on the “pulse of what students are talking about.” It’s also his inspiration for the design decisions that have helped turn the company into the world’s largest interactive online classroom, with a mission to deliver a world-class free education to anyone, anywhere, at anytime across the planet. Khan Academy’s lead designer Jason Rosoff, with two of the company’s designers Tabitha Yong and Marcos Ojeda. Since its founding in 2008 by former hedge fund analyst Salman Khan — who was making math videos in his spare time to tutor his cousins — Khan Academy has emerged as a new way to learn; one that is self paced, approachable, conversational and tries to help students master individual subjects before moving onto the next. Bill Gates is a big fan, as is Google and its chairman Eric Schmidt as well as Netflix CEO Reed Hastings — all of these big names invested in the company. While millions of users access the site and watch its content, 30,000 classrooms also use the videos for in-school teaching and teachers (they call them coaches) can also use the software to track student progress. All of these moving parts are tied together by an understated design ethos that highlights simplicity, puts the content first, and tries remove frustration and friction from learning. At a time in Silicon Valley when everything’s getting major design treatments — from connected thermostats to calender apps — Khan Academy is using design to get out of the way of learning. Khan Academy is a content company first and foremost, with hundreds of thousands of micro, modular bits of education videos that use Khan’s now famous ‘over-the-shoulder’ tutoring technique. Khan — who Russian investor Yuri Milner called the world’s first superstar teacher — has made thousands of these videos himself, doodling out equations on the screen and soothingly talking his viewers through complex math problems without appearing onscreen in the sessions. It’s this unique content that Rosoff, and his team of three designers, put at the center of the site design, as they seek to remove laborious processes and distracting software. The overarching goal of the design is to “make the software recede into the background,” says Rosoff, emphasizing that “the content is the experience; there is no separation.” For example, the videos take up almost the entire screen when you’re viewing them, adding to the feeling that everything else has stopped and Khan is sitting in the same room as you, as your personal tutor. 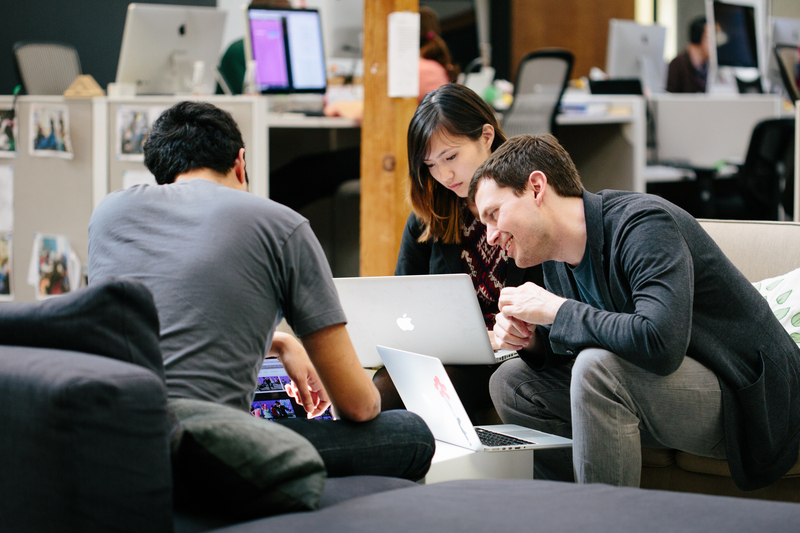 Designing that much simplicity into the product isn’t as simple as it sounds. Rosoff noted that whenever the designers put software in the way of students viewing content and learning, the users would push back, and the team would realize the mistake and peel it away. Hence, why the morning user feedback sessions are so important. When students do interact with the Khan Academy software itself — and not the videos — the design team has worked hard to deliver a feeling of approachable learning and friendly conversation, some of it through the text itself, and some of it through color choices. The idea is to use design to remove some of the inherent frustrations of learning and keep users coming back. 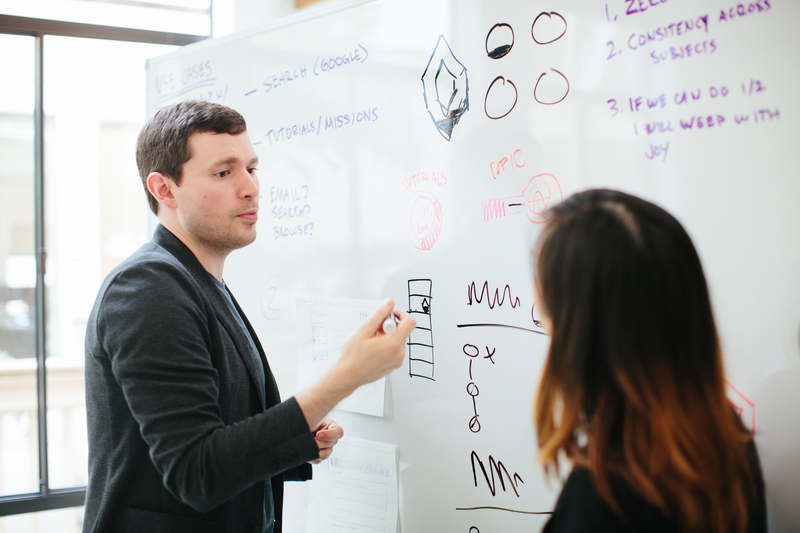 Khan Academy head design Jason Rosoff discusses layout with designer Tabitha Yong. For example, Khan Academy originally used green checks and red X’s to track problems that students got right and wrong. The universal stop-and-go color codes were understood by everyone, but there was one problem: “people got really bummed out by the red X,” Rosoff said. So the team started to brainstorm how to change that in order to reduce that frustration. It turns out that just changing the red X to a neutral gray X made students feel much better when they got a wrong answer. “We don’t emphasize that you made a mistake, we emphasize that you did something correctly,” said Rosoff. It’s moments like those that made Rosoff realize that there were ways in which the software itself could support Khan Academy’s mission to deliver this new type of education. Early last year the design team launched a total visual refresh of the site with a particular focus on using color-based navigation for domains like math and science. Khan Academy’s design team is also helping the company address a unique issue with the way its users consume content. Many of Khan Academy’s users go onto the site to solve one specific problem — they need to refresh their understanding of fractions, or pass a test — so they watch some content and then they leave. But some of Khan Academy’s users end up sticking around and using the site to supplement, enhance or complete their learning across many topics. These are the power users and are using the site in a much more aspirational way. Khan Academy is designing the site for both these types of users. Rosoff described it as an approach that is “supplemental but exhaustive.” The idea is to solve their immediate problem as quickly as possible, and then offer them the ability to buy into this bigger adventure, he explained. 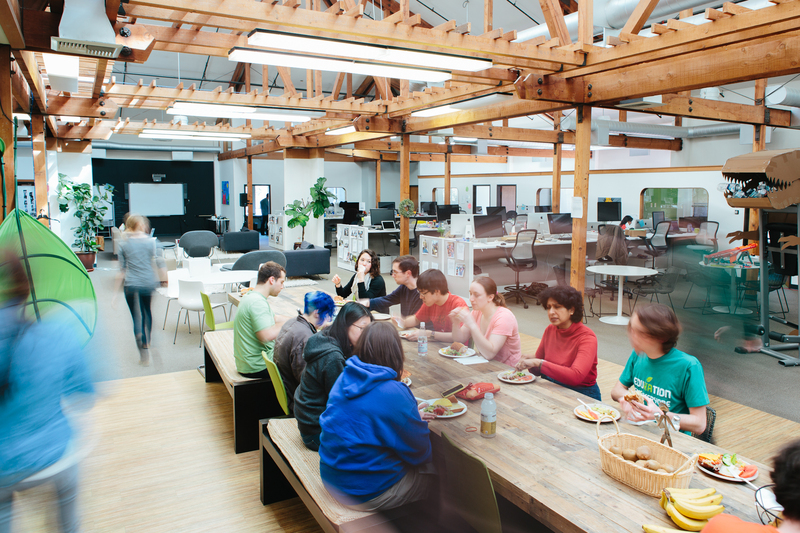 The Khan Academy office in Mountain View, California. One tool that Khan Academy has built to get users to buy into this “bigger adventure” rests with the “Learning Dashboard.” The company launched it last year — just for math content for now — and it acts as a user’s personalized home page that tells them where they left off the last time they visited and guides them to the next step or piece of content. It’s a little like the personalized page you see when you log onto Netflix or Amazon. This year Khan Academy’s designers will be working on expanding the Learning Dashboard to the rest of the domains beyond math. Rosoff and his design team will also be looking hard at figuring out their mobile strategy this year, determining what aspects to tackle first through mobile, and how to enable interaction with current content on cell phones. Khan Academy is hiring more designers (two more for now), and it’s also working with Designer Fund on their Bridge apprenticeship program. Designers that apply for the Bridge program can get matched with Khan Academy and start working with the design team this spring. Khan Academy is a mission-driven nonprofit with an ambitious goal to create a “one world classroom,” as Khan described it in a TED talk in 2011 that helped put the company on the map. Being a non-profit means certain things, like none of the 55-person team will become millionaires in an IPO or acquisition. But being a non-profit also means that the team doesn’t have to sprint to the finish line — and show unnatural growth to hit certain financial metrics. They can slow down and run the long marathon. Because no doubt the future of education might take awhile to unfold. In the 1920’s H.G. Wells envisioned, in “Salvaging Civilization”, using multimedia like videos and audio recordings to bring education to millions. In the the 1960’s Buckminster Fuller envisioned networked documentary call-up systems with videos created by multidisciplinary teams. In the late 1970’s I used an electronic red and green led multiple question device that came with question booklets. In the next forty to fifty years, universities and some high schools had educational videos and interactive computer tutorials that they never really made much use of. The material also was proprietary and restricted only to students of specific ages within the educational system. Mr. Khan took the initiative and bypassed the professionals and done what the professionals were too hesitant and fearful of doing because of guild thinking and budget whining. I like what Khan Academy is doing in developing connected levels and paths of learning sort of like badges in Scouts. It may be old school, but it is online and accessible. I know that Dr. Roger Schank does not consider what Khan Academy is doing to be a best practice, but I think Khan Academy can easily upgrade to the educational ideas expressed by Dr. Schank and create multidisciplinary teams to produce interactive goal-based scenarios that are domain specific and readily applicable to specific real-life tasks. David Thornburg might say Khan Academy is building campfires. The math campfire is certainly burning well. I am looking forward to the Khan Academy holodecks of the future. Websites such as Khan or MathTV.com can surely be the solution to many educational issues as they provide access to nearly everyone wanting a free, high-quality education. Just to be clear, Khan says his site can provide a â€œfree world class education to anyone, anywhere.â€ By the design of the site, this must mean a â€œworld class educationâ€ consists of mastering content with no need of real world application. Khan cannot assess what happens after the badge. And in the end, thatâ€™s why the Academy is more about teaching than it is about learning. Itâ€™s knowing without doing when these days all that matters is the doing. If this is how we are to define an â€œeducation,â€ the stuff that we can put into a ten minute video and give a test on, weâ€™re all in trouble. This is great for the 30% of the world that has internet access. I really like Khan Academy. Good going guys.. Appreciate all that you are doing. The next gen will not be about knowledge. It will be about wisdom and application. When I taught classes, I decided to only use a green pen to mark the students’ work, to denote “Green=Go” and to avoid the negative connotation of the colour Red, and also, just so my comments could show up more clearly on the page (as opposed to the gray/blue/black of the students’ own work). Correct work would have “C” marked beside it or just left alone. Incorrect work would be circled (either the answer or the number/letter which indicated the item in question). The circle meant, “this needs attention”–not “this is wrong”, which might be frustrating and hinder thought. Just a tip which I thought might be helpful/useful. Thank you. Conversational style? Goodness gracious. I thought conversation means both sides communicating. What you have for math is Khan lecturing and then some guinea-pig radio button clicking. Until they devise a way for students to interact over the subject, they’re mending broken stuff, not building the future. To replace an incompetent lecture with a competent one is a small step forward. When you try to solve a meaningful problem yourself, modeling and filtering and abstracting and communicating, and finding better and more effective ways to communicate about the problem – that is when learning happens. It’s interesting to note that the Valley actually gets learning when it comes to coding – surprise, surprise. Their coding site lets you write programs yourself instead of clicking on checkboxes, share and comment on the codes, use other people’s snippets etc. Khan Academy has over 100,000+ interactive exercises for math, with immediate feedback and data-based indications of how well a user knows a particular skill. Definitely a step up from passive lectures! That’s precisely what I call guinea-pig mouse-clicking. They’re definitely not just radio-button clicking tedium. Activities range from interactive graphs to inputting actual answers to building your own projects both on the platform (Computer programming) and outside in a classroom (Discovery Lab). Definitely try them out sometime, and give feedback wherever you can! how do you “invest” in a non-profit? Or have they donated? There is an obvious market-based mechanism for Microsoft to support the Khan Academy – co-develop and sell a Khan Academy Edition of the XBox One, where users have to earn time for game play on the weekends by their achievement or effort on grade-level appropriate Khan Academy courses during the week. I’d sure want to buy one for my teenage son. For him, games like Dark Souls are little better than eCrack. Microsoft could even go further and incorporate similar Khan Academy based incentives in the Family Safety parental controls of the Windows OS. I think they are targeting the part of the world that doesn’t have access to XBox’s.